Bristol enterprise hub Engine Shed is looking for a new occupier for its Arrivals Lounge after another tenant has outgrown it. The 600 sq ft office space, which leads off Engine Shed’s Members’ Lounge, pictured, will be available from February 7 on competitive and flexible terms. It has room for around 20 desks. Its latest occupier, tech giant Oracle’s Startup Cloud Accelerator, moved in in 2017 after choosing Engine Shed as the sole UK location for its global support programme on the back of Bristol’s reputation as a global tech hub. 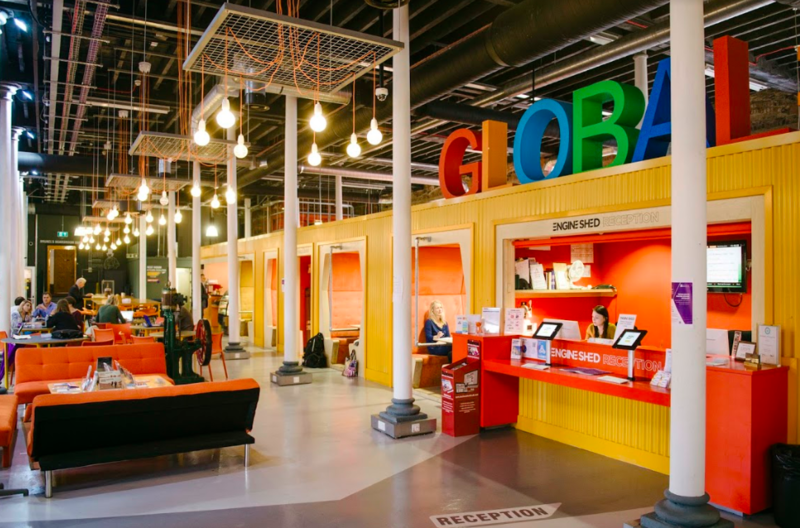 In a worldwide operational change, the US tech giant has now rebranded its accelerator to become the Oracle Global Startup Ecosystem and has, appropriately, scaled-up its Bristol accelerator, which is on its second cohort of businesses. During its tenancy in the Arrivals Lounge, Engine Shed has supported Oracle, offering a great environment to test the model. Engine Shed, which is based next to Bristol Temple Meads railways station, said Oracle outgrowing the Arrival Lounge demonstrated this kind of support. Previous Arrivals Lounge tenants have included West of England tech sector group TechSPARK, Somo, the world’s largest independent mobile solutions company, and Just Eat, the takeaway website group – all of which used it as a launch pad for their Bristol operations. Engine Shed operations director Karen Drake said it was seeking a new occupier that would benefit from the environment and bring value to Engine Shed’s community and its vision of growing an economy that is inclusive, sustainable, beneficial to all. “The Arrivals Lounge is an attractive offering for growing businesses, especially those new to the South West and those planning to scale up in the region,” she said. To find out more or to register interest, contact Karen Drake. Engine Shed, housed in Brunel’s original station at Temple Meads dating back to 1841, is a collaboration between Bristol City Council, the University of Bristol and the West of England Local Enterprise Partnership and is at the heart of the Temple Quarter Enterprise Zone.